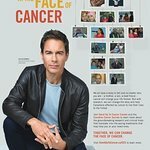 Stand Up To Cancer (SU2C) and the Cancer Research Institute (CRI) have teamed up to develop a new print public service announcement featuring NCIS star Mark Harmon. 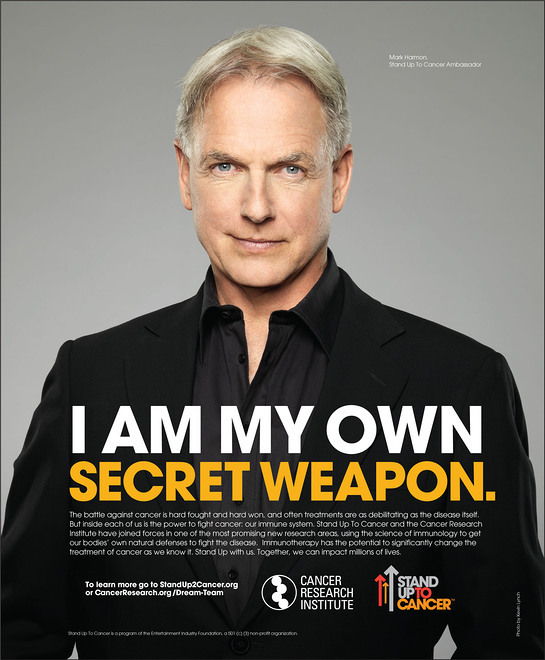 Mark Harmon in the new PSA with The Cancer Research Institute (CRI) and Stand Up To Cancer (SU2C). The PSA, entitled “I Am My Own Secret Weapon,” is designed to increase awareness about cancer immunotherapy, which mobilizes our immune systems to fight cancer. One in two men and one in three women will get some form of cancer in their lifetimes, and every day, nearly 1,600 Americans die from cancer. This debilitating disease can often make people feel like they are no longer in control of their bodies. Through this PSA, SU2C and CRI increase awareness of the need to support more research on immune-based cancer treatments. Mark Harmon has starred as Leroy Jethro “Gibbs” in the hit CBS series NCIS for 10 years. He has been nominated for two Emmys, four Golden Globes, two Screen Actors Guild Awards and two People’s Choice Awards for roles he has played throughout his career including The West Wing, Chicago Hope and NCIS. CRI is dedicated to the support and coordination of laboratory and clinical efforts that will lead to the immunological treatment, control and prevention of cancer. Through its advancement of cancer immunology research, CRI is learning how to manipulate the human immune system to target and attack cancer. In December 2012, SU2C and CRI announced the formation of a Cancer Immunology Translational Research Dream Team, dedicated to exploring the complex relationship between cancer and the immune system. With $10 million in funding over a three-year period, this project will unite laboratory and clinical efforts to work toward the goal of discovering immune-based solutions to fight cancer. The Dream Team, led by James P. Allison, Ph.D., of the David H. Koch Center for Applied Research of Genitourinary Cancers at The University of Texas MD Anderson Cancer Center, and Antoni Ribas, M.D., Ph.D., of the Jonsson Comprehensive Cancer Center, and member of the Eli and Edythe Broad Center for Regenerative Medicine and Stem Cell Research at the University of California, Los Angeles (UCLA), is exploring “Immunologic Checkpoint Blockade and Adoptive Cell Transfer in Cancer Therapy.” Scientists on this Dream Team represent eight institutions: MD Anderson Cancer Center, UCLA, The Johns Hopkins University, Fred Hutchinson Cancer Research Center, Dana-Farber Cancer Institute, California Institute of Technology, Memorial Sloan-Kettering Cancer Center, and the Netherlands Cancer Institute. To learn more, click here or visit CancerResearch.org.